This Is a News Trader EA that has many similarities to other News traders. 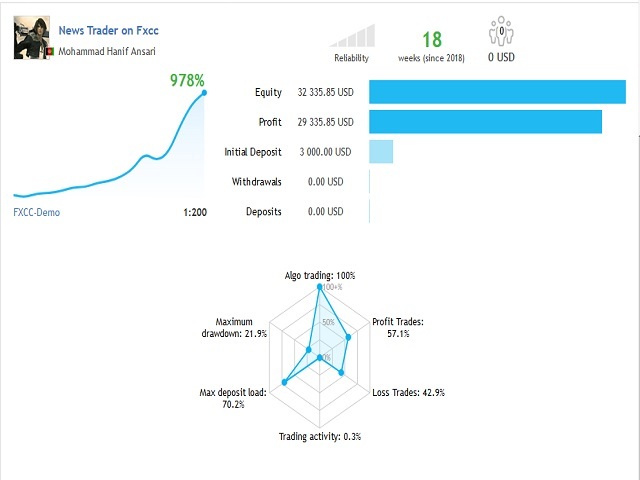 Strategy is placing two pending order some seconds before releasing high impact economic news on investing.com and removing remaining pending order some seconds after news releasing time and there are some extra features like trailing Stop , hidden trailing stop , recovery loss and lot multiplier. But what is very important it's choosing proper setting of parameters in proper broker. 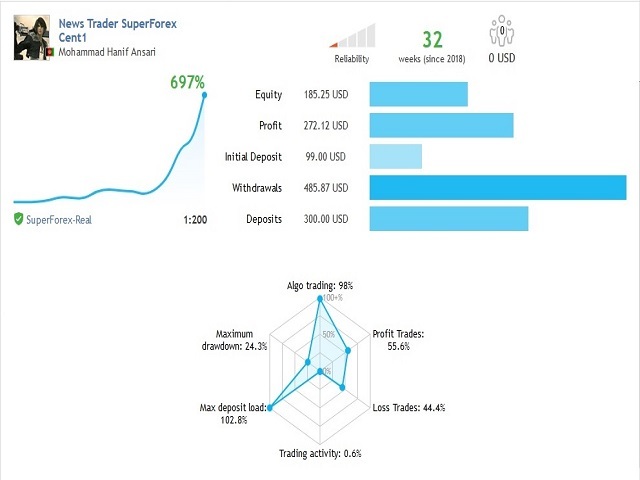 The EA is tested in demo accounts of several brokers successfully and currently is working in real account. You can check the following links to see trade result. Offline Economic Calander html File Name: It's possible to do back test, only you should save weekly calendar webpage from investing.com and save it as ".html" file and put it n MT4 DataFolder/Tester/Files. Also you should write Name of saved page to this parameter. 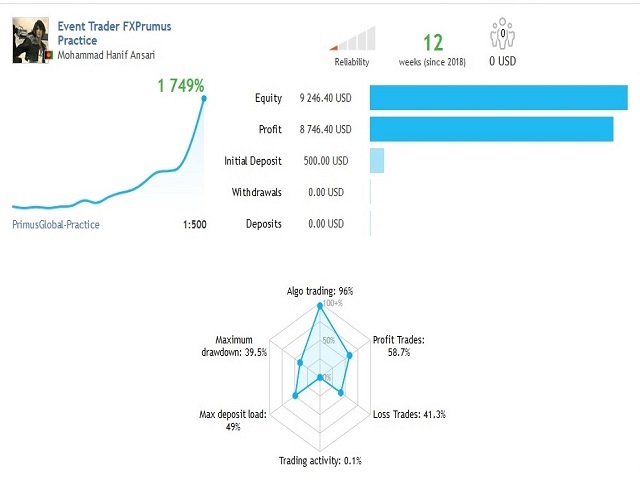 Dynamic Lot (% of Equity,0=Disable) : Using this parameter the EA will calculate lot size based on account equity. If you choose 50 and if( Equity=100, Leverage=1:500, 1 Lot=100000 ) Lot will be (100*500/100000)* 50% it means Lot=0.25 . If you choose 0 the EA will use Fix Lot Size always. Trail Stop(Pips): Pip distance between Stop Loss and Market Price when moves in favorable direction. Trail Start(Pips): Pip distance between Stop Loss and Order Open Price after first Stop Loss moving. Trail Step(Pips): Pip distance between two stop loss movement. Recovery Profit: In Hidden Trailing Stop closing , Total profit couldn't be less than Lot Size*Recovery Profit. Pending Order Distance(Pips) : Pip distance between Ask and BuyStop, and Bid and SellStop Orders. News Currency : To define which currency should consider by EA to detect related news on Economic Calander. Trading Symbols for USD News: if you have “USD” in "New Currency" the EA will trade on symbols of this field when “USD” related news happen. Trading Symbols: The EA searches this field to find and Trade on symbols which contains currency of “News Currency” field . Example: if you write “News Currency =GBP, CAD,USD”, and “Trading Symbols= GBPUSD,EURCAD”, The EA will trade on GBPUSD when GBP related news happen also will trade on EURCAD when CAD related News happen. Update News Intervall (sec): The EA will update news after this period of time in Seconds. Trade Server Time Zone,Minutes (GMT+): This parameter is most important parameter and you should set it according time difference to GMT in minutes. News Filtering1 ,2,3,4: could be used to tell the EA don’t trade on this news. Draw only future news lines : to Delete Past News Lines from Chart. High impact news color: To define High Impact News line color on chart. Medium impact news color : To define Medium Impact News line color on chart. Low impact news color: To define Low Impact News line color on chart. Line style:To define Style of News lines on chart.